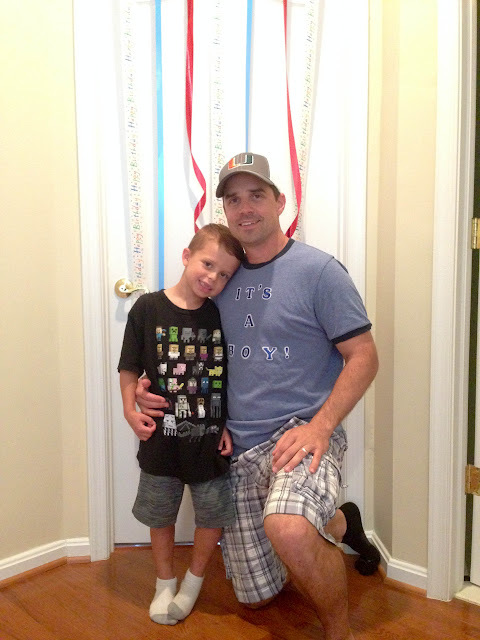 On the last night of summer vacation, I had to be sure to get Jonathan's birthday post up before sharing all the First Day of School pics! 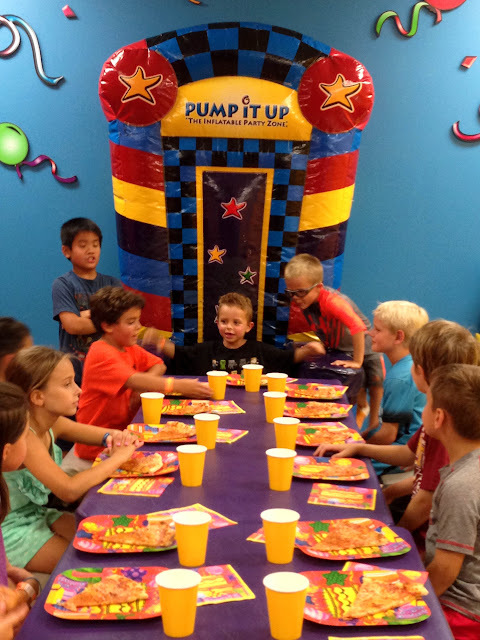 Our little munchkin turned 6 less than two weeks ago. 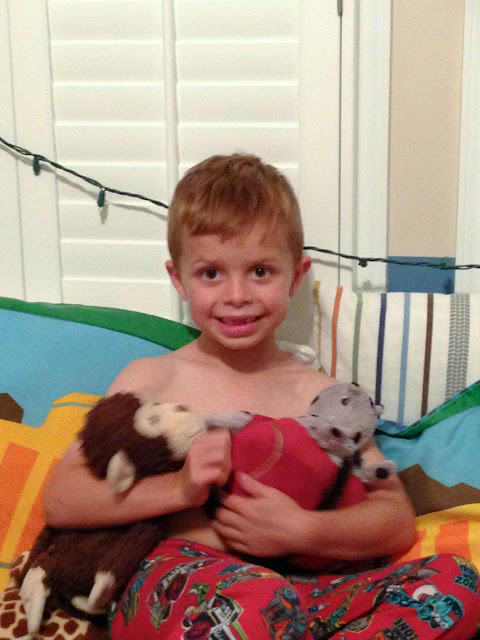 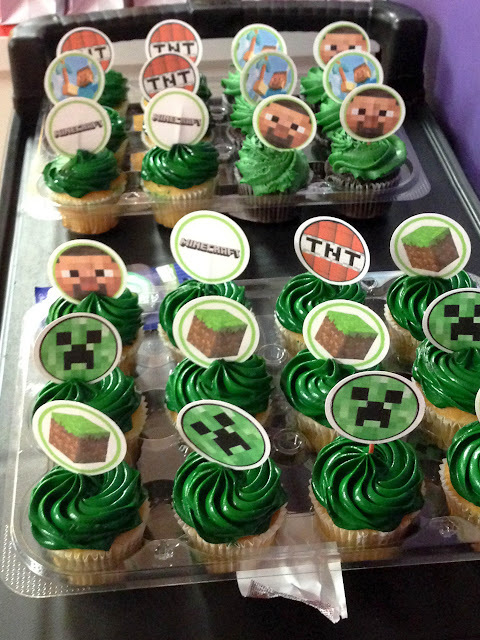 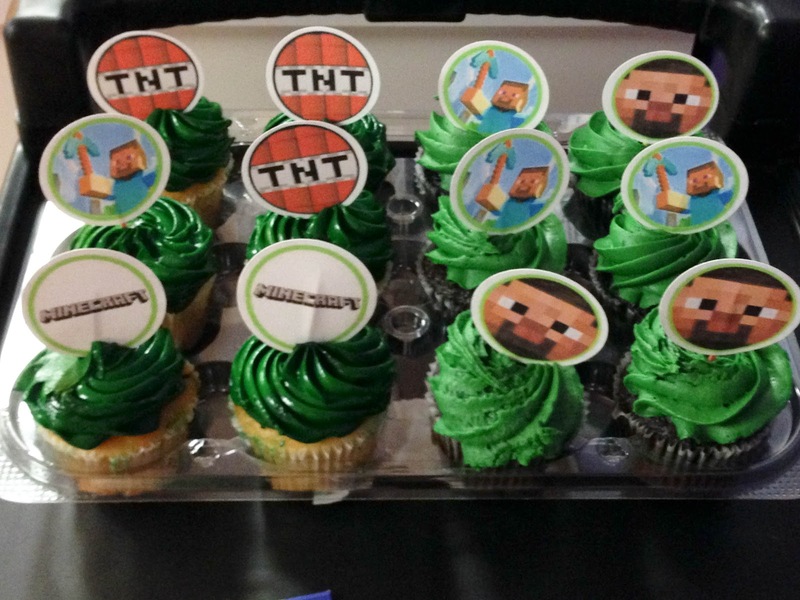 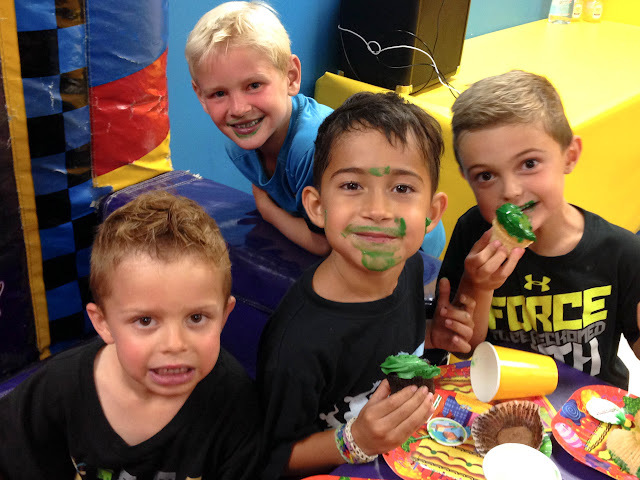 He had a Minecraft themed, fun-filled day with his best buds! 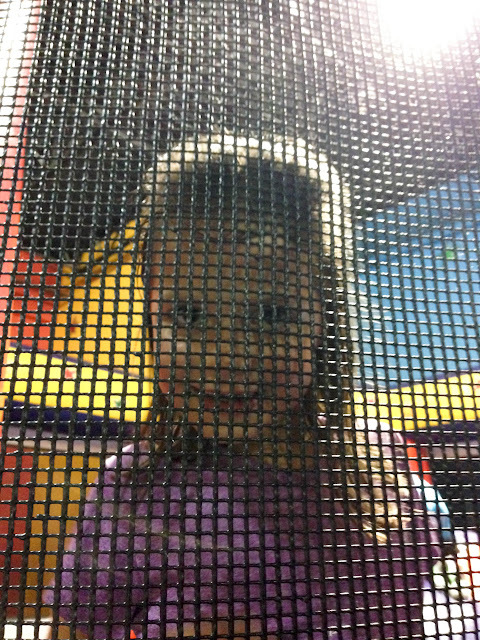 Last night going to bed as a 5-year-old. 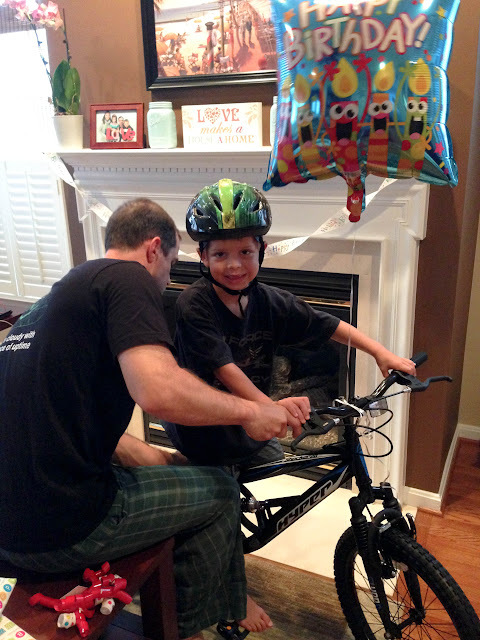 Getting his new bike adjusted. 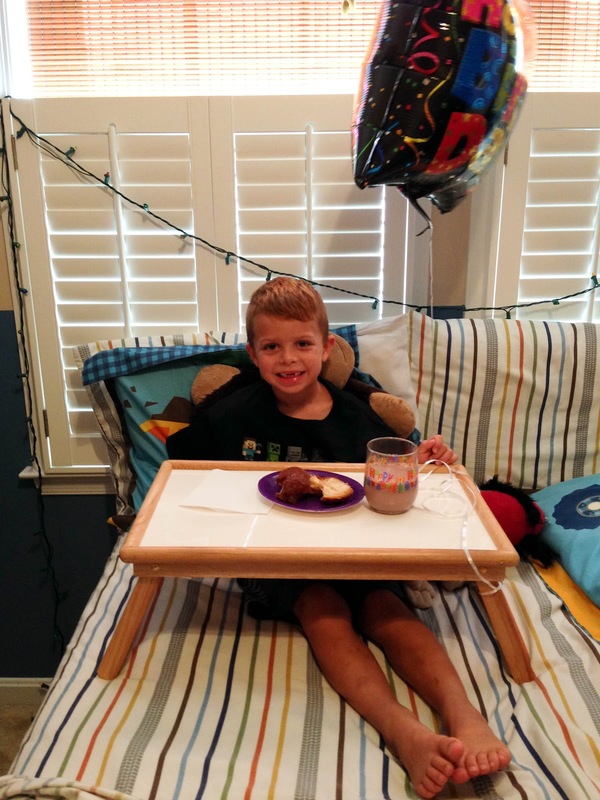 Then it was back to bed so he can be served breakfast in bed (his request). ...and roller blades we went to Chuck E. Cheese's to play some games. 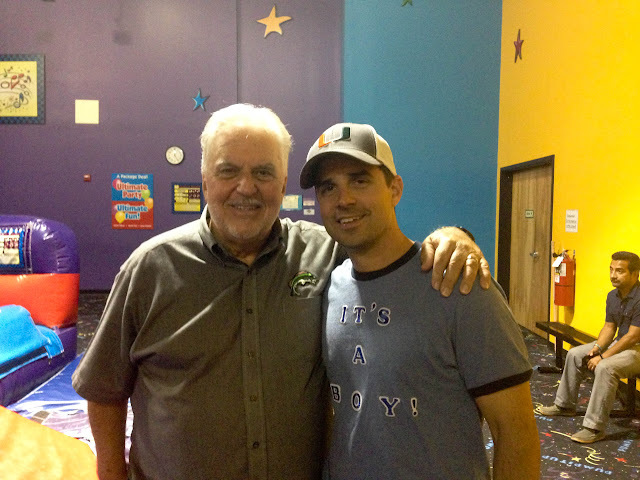 Ron takes this same picture with Jonathan every year on his birthday. He made that shirt and wore it the day Jonathan was born. 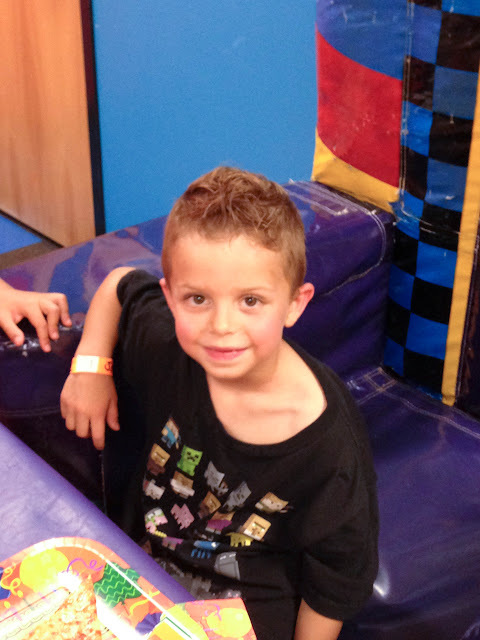 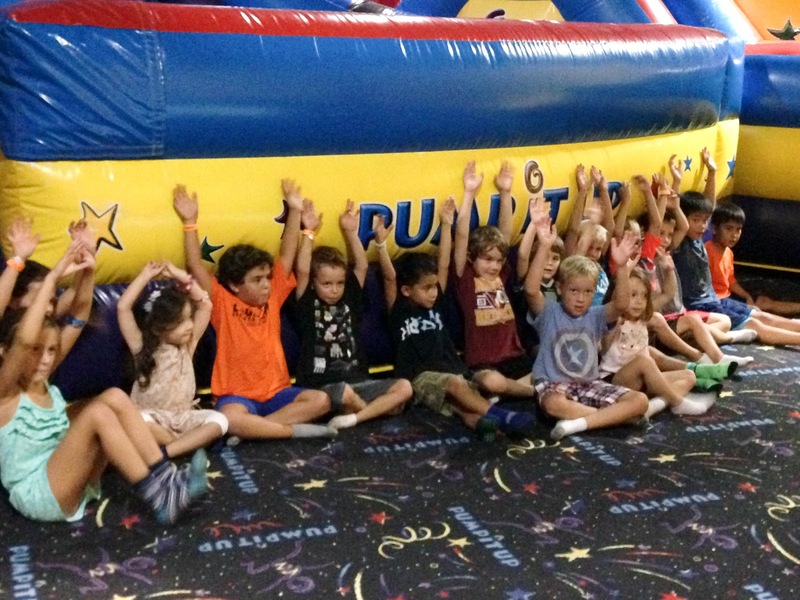 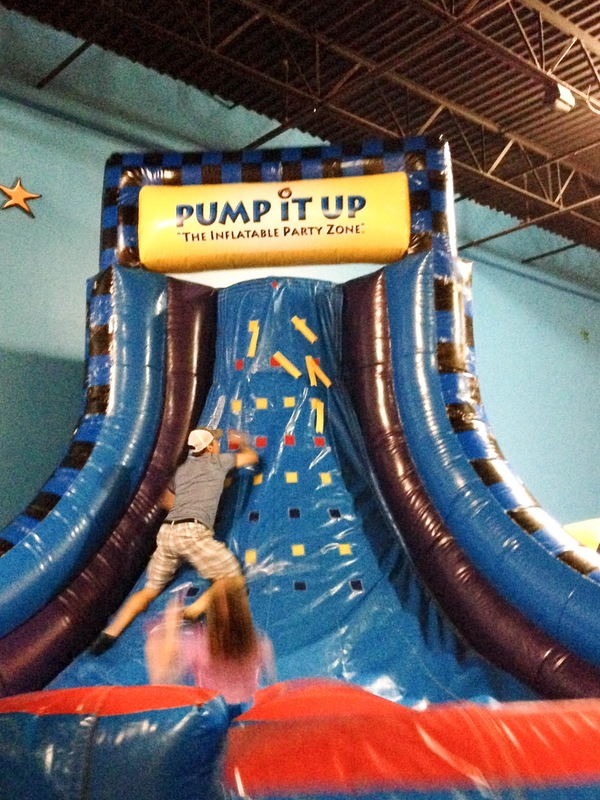 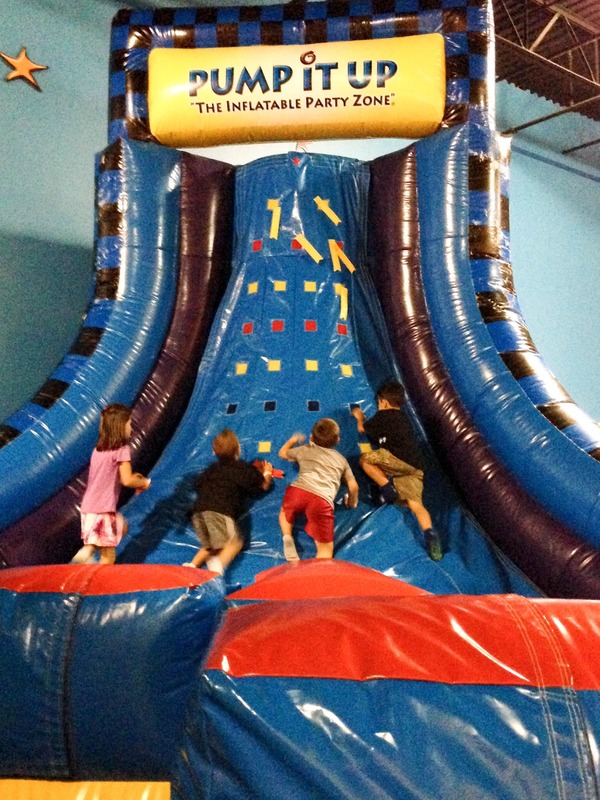 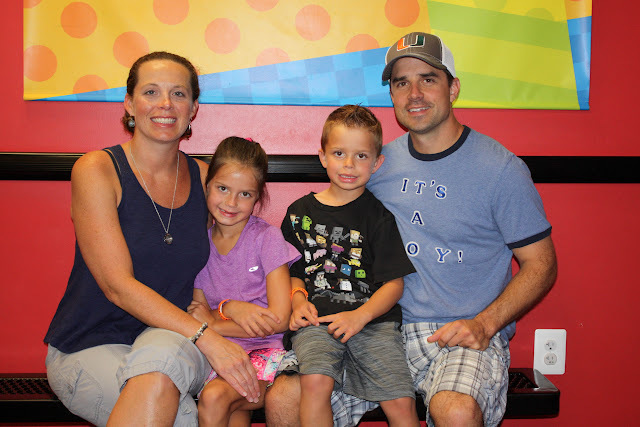 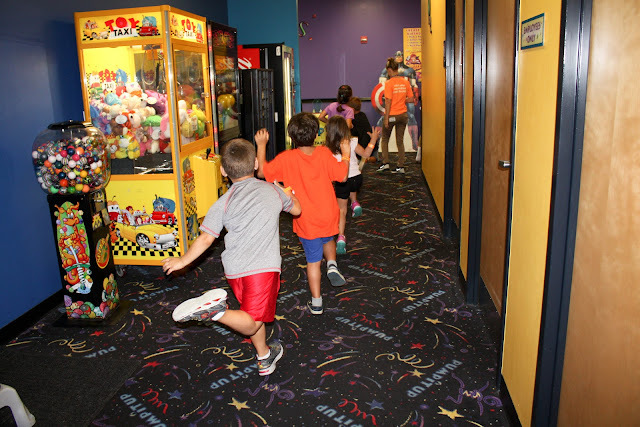 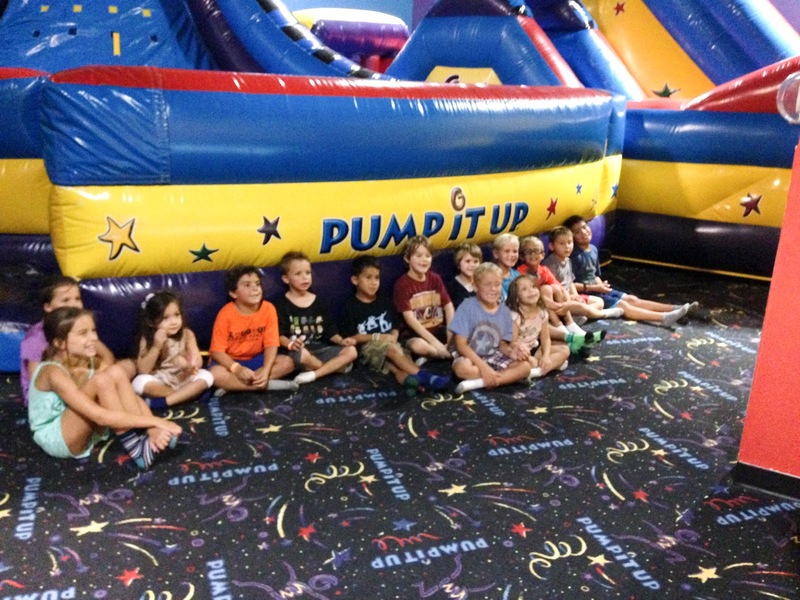 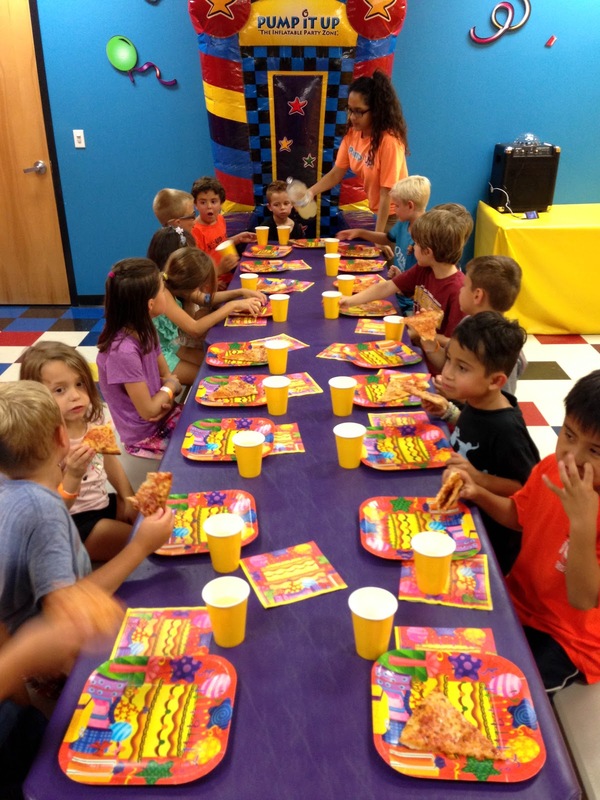 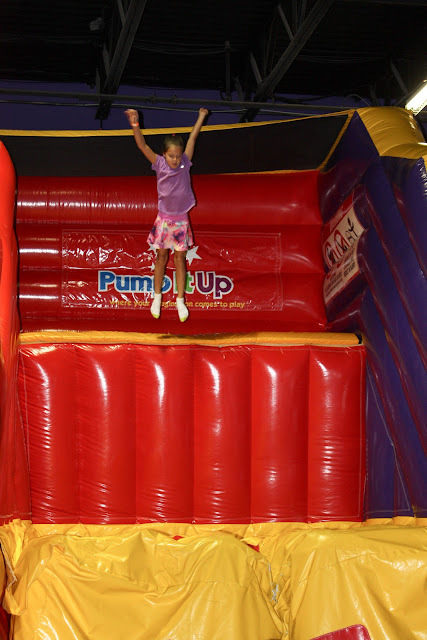 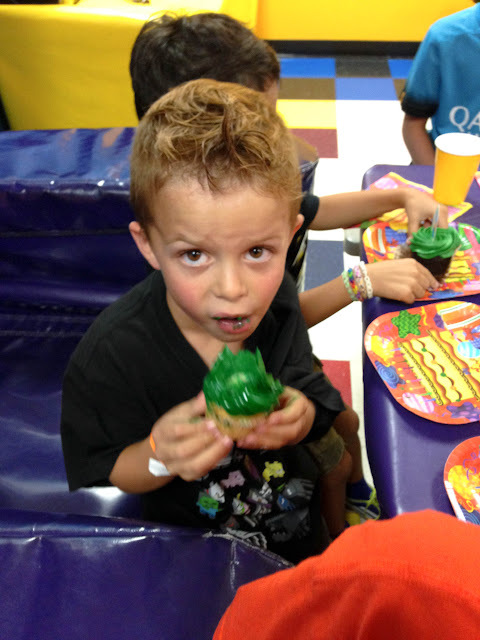 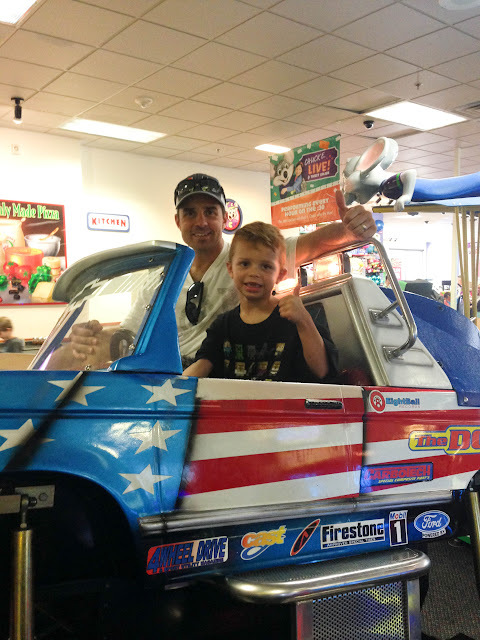 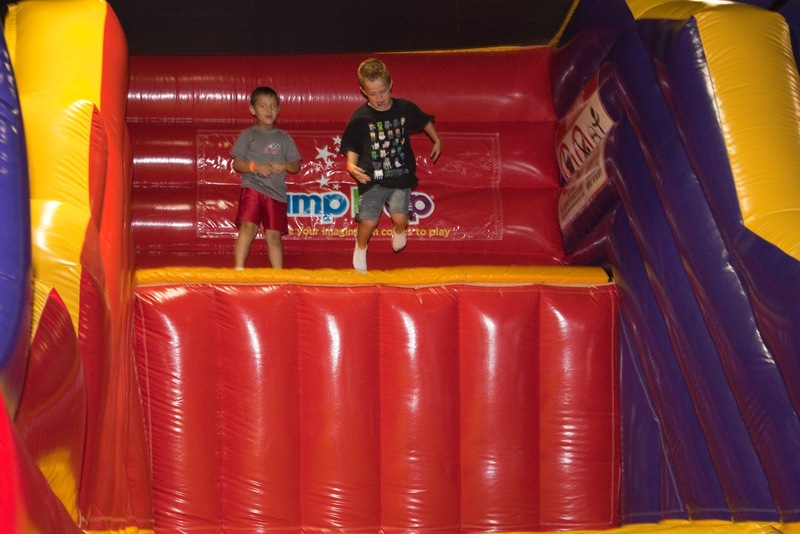 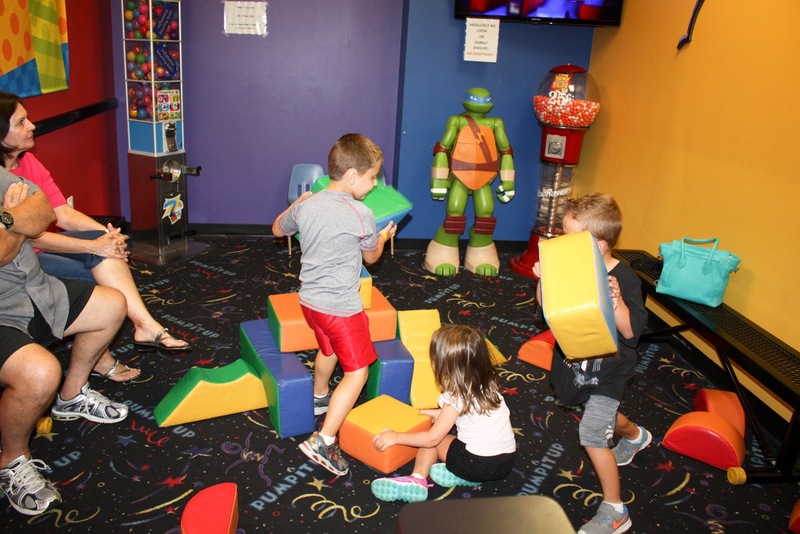 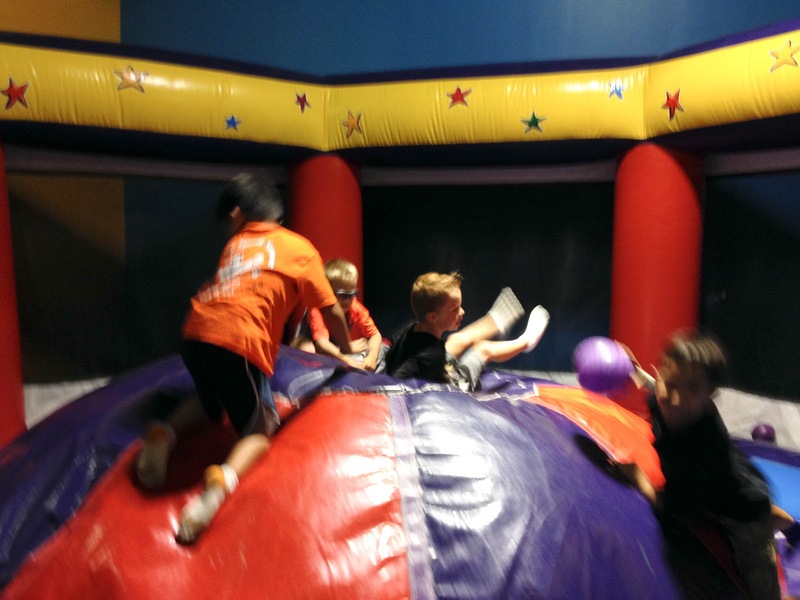 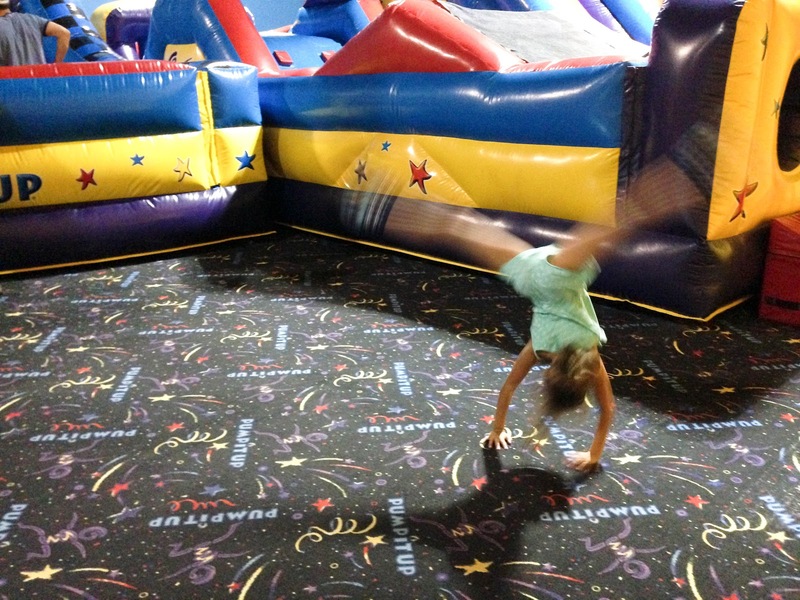 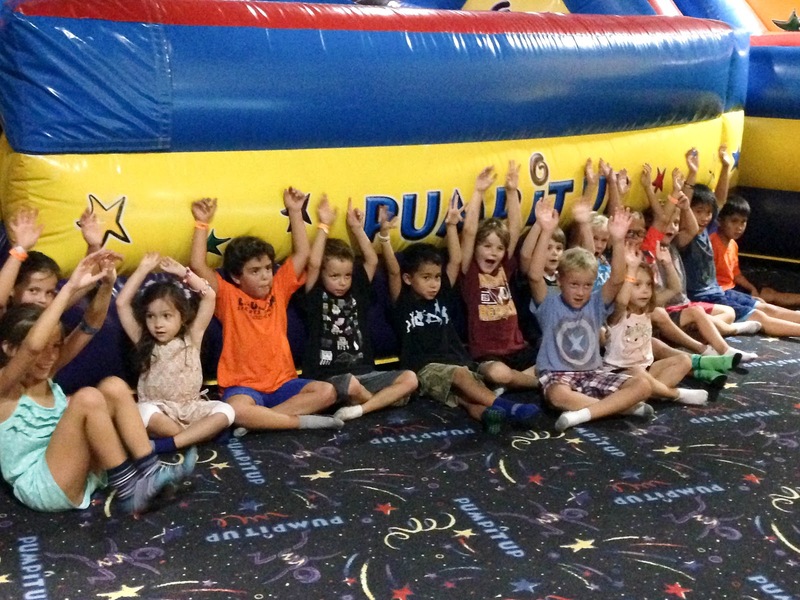 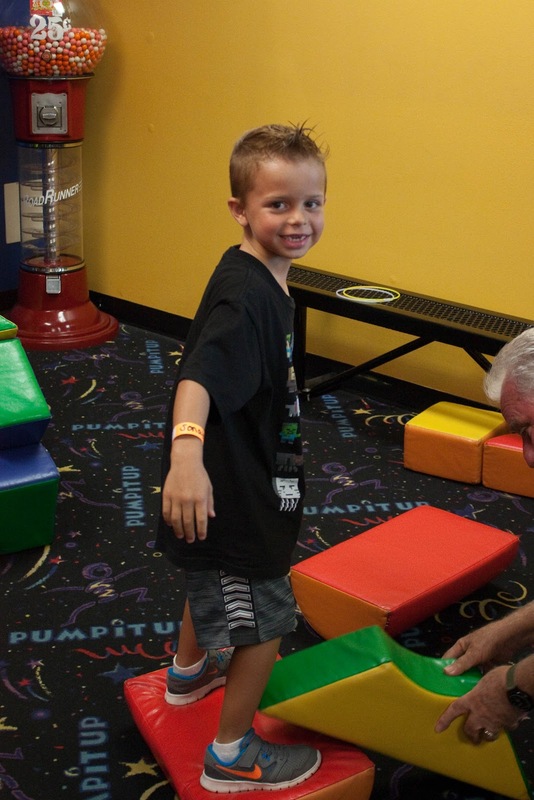 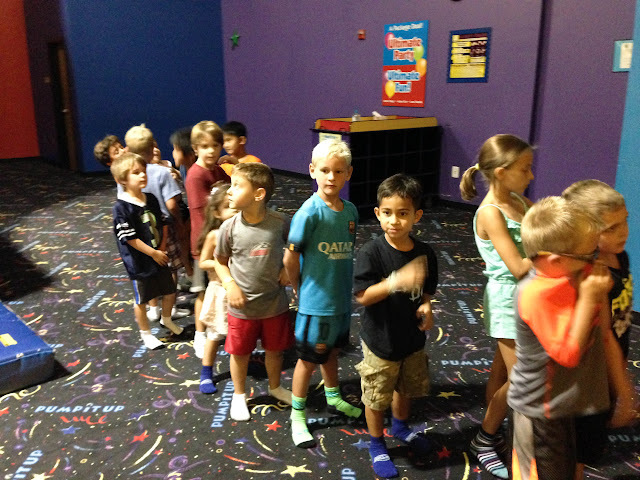 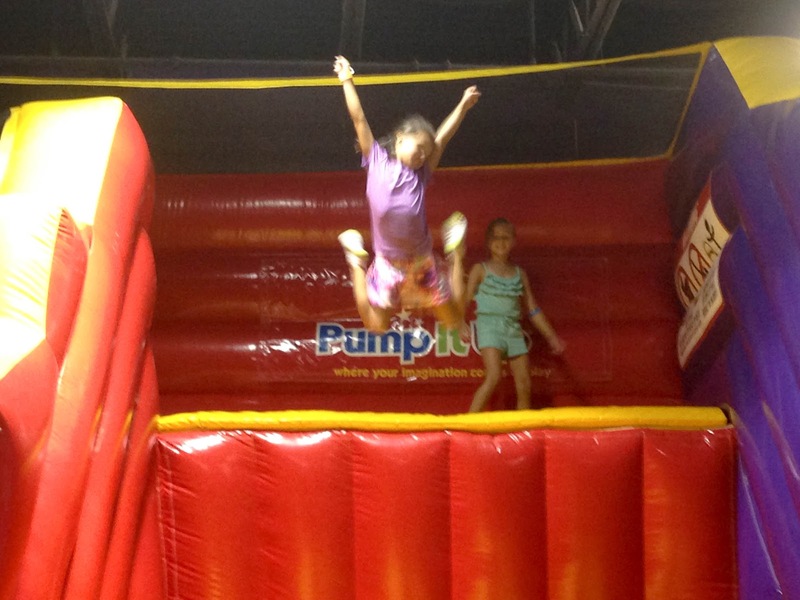 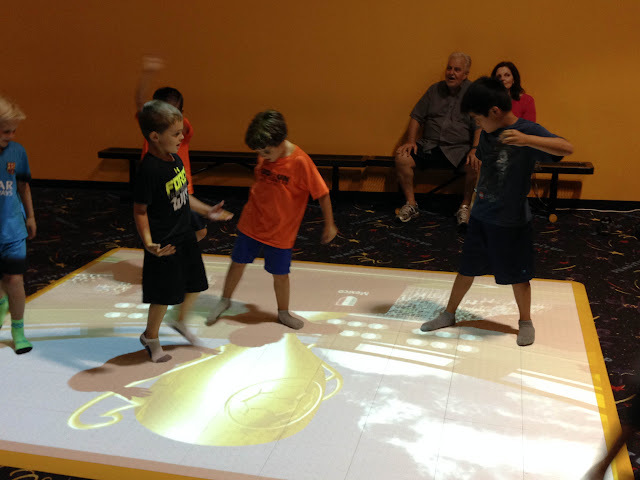 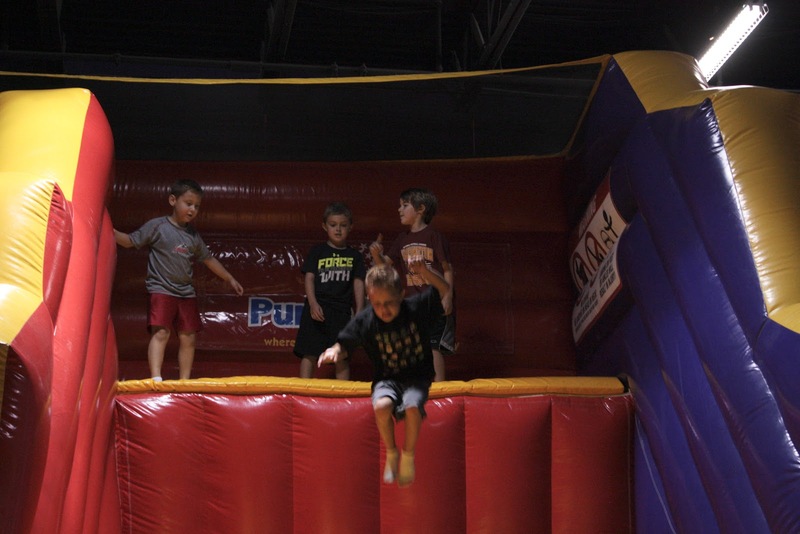 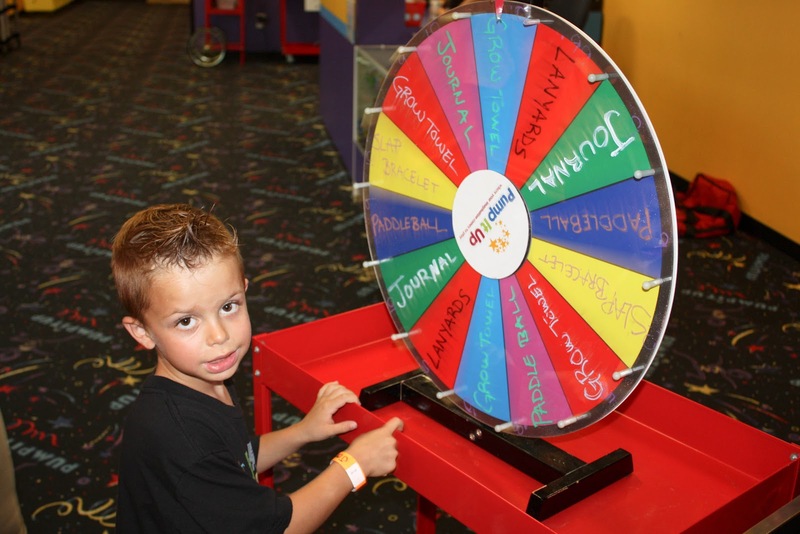 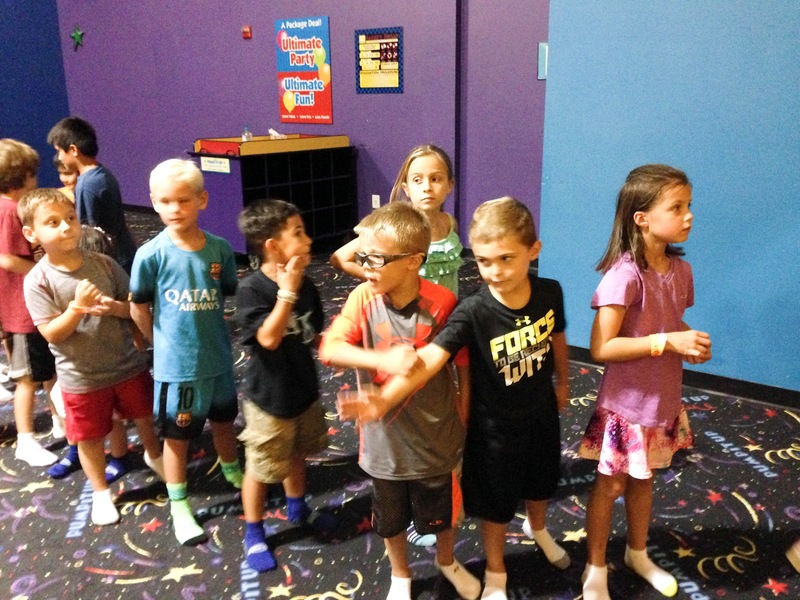 Party time at Pump it Up! 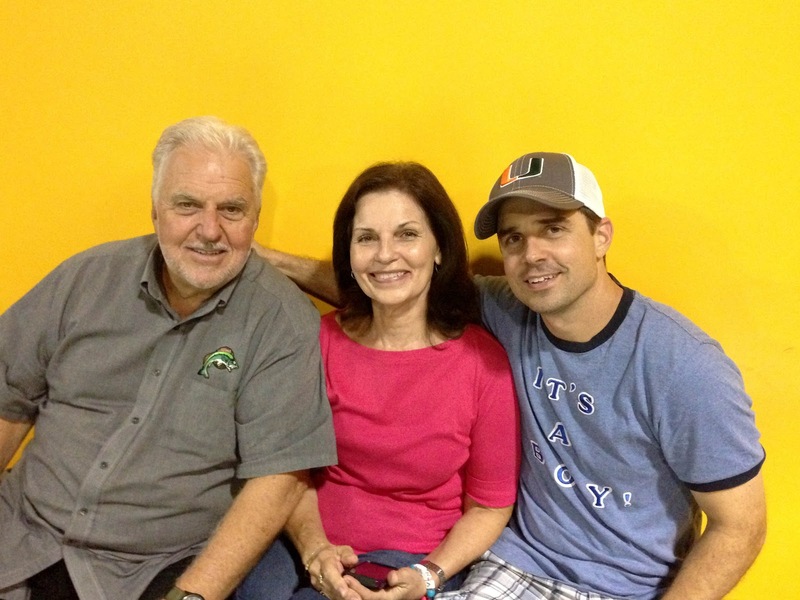 We were lucky to have Mom and Dad T in town for the celebrations. 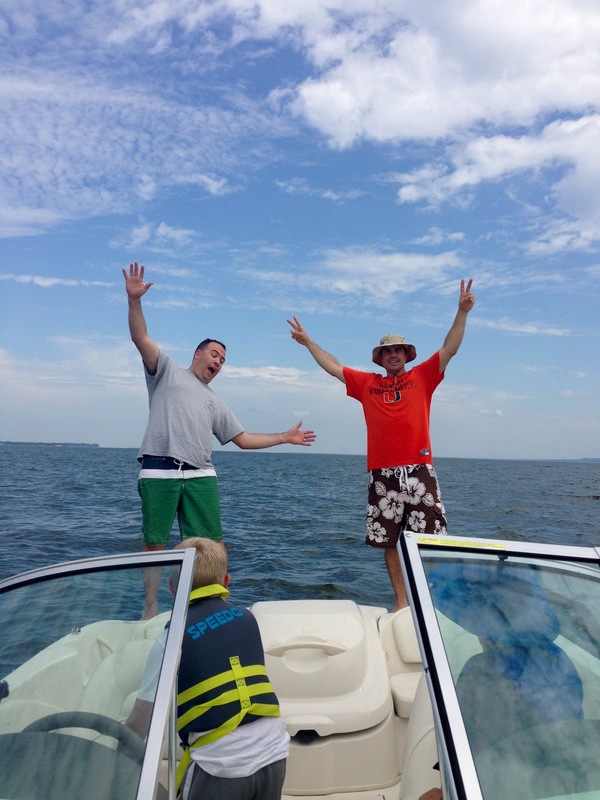 The dads even got in on some of the fun. 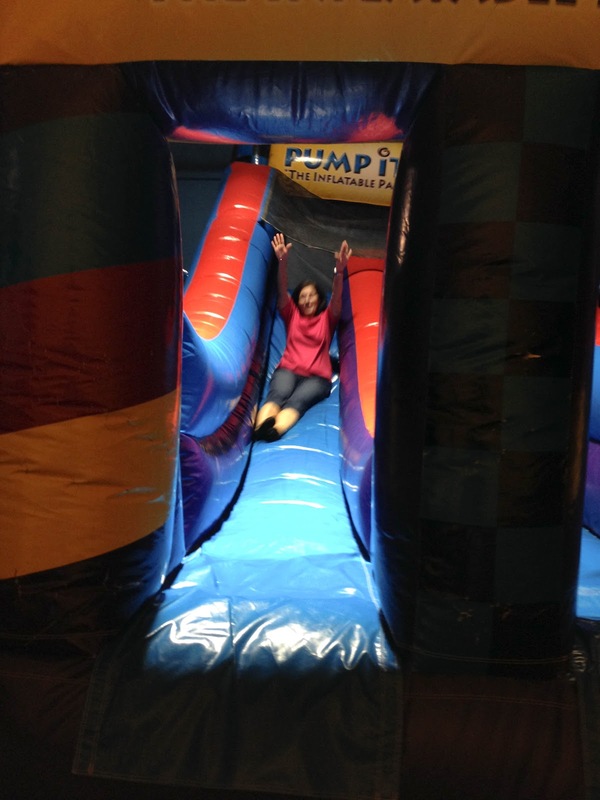 Nana T braved the obstacle course! 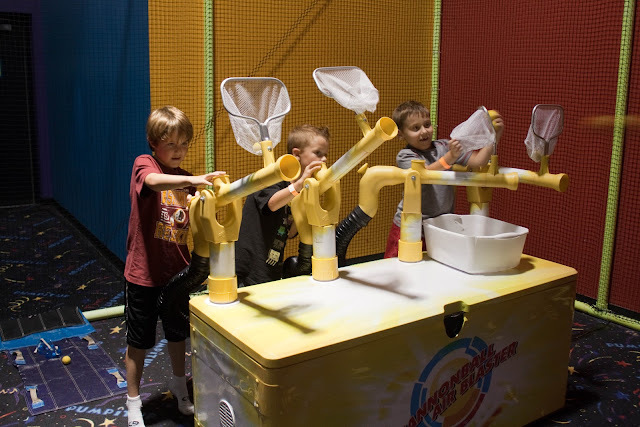 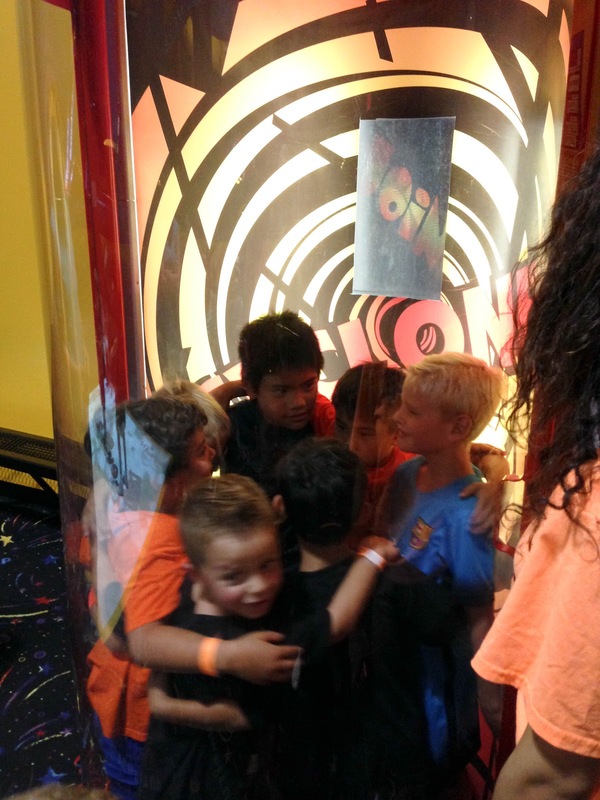 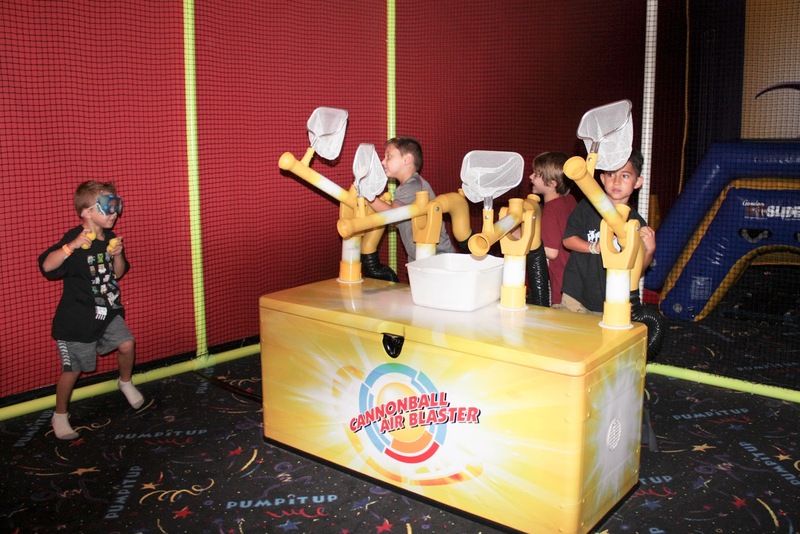 The kids crammed into the cyclone simulator, only to find out it wasn't working. 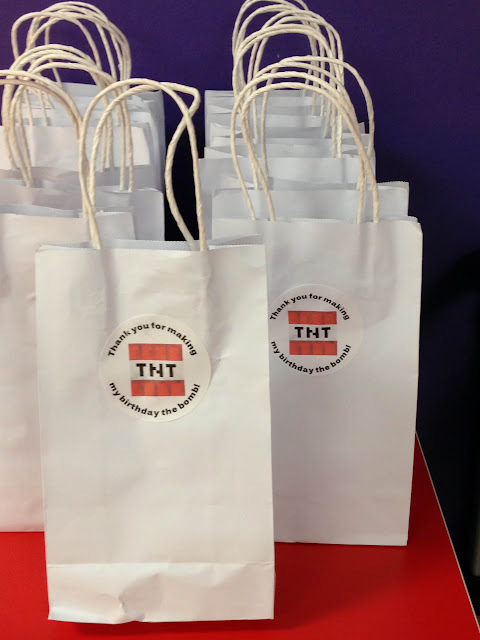 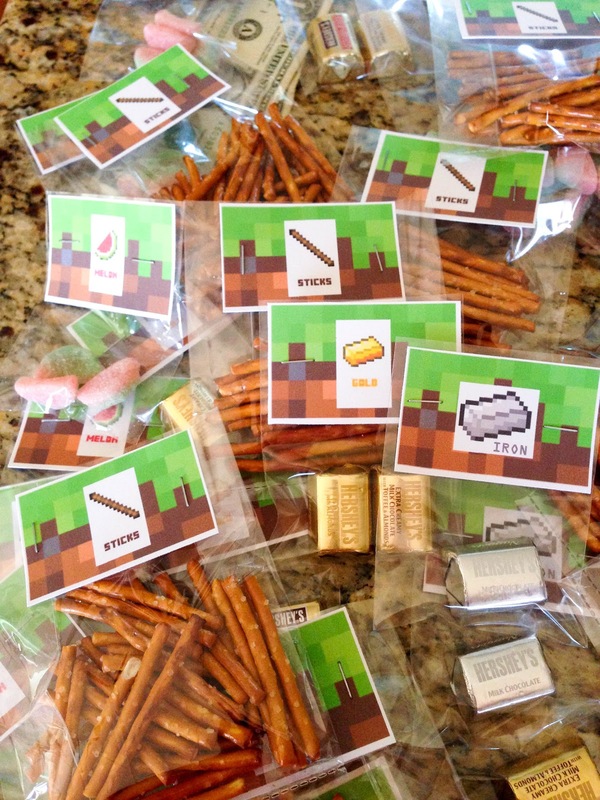 Inside the goodie bags were smaller bags of Minecraft foods. 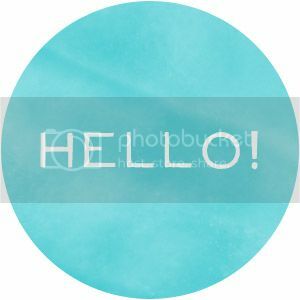 Thanks to Mimi Cute Lips Blog for the printables! 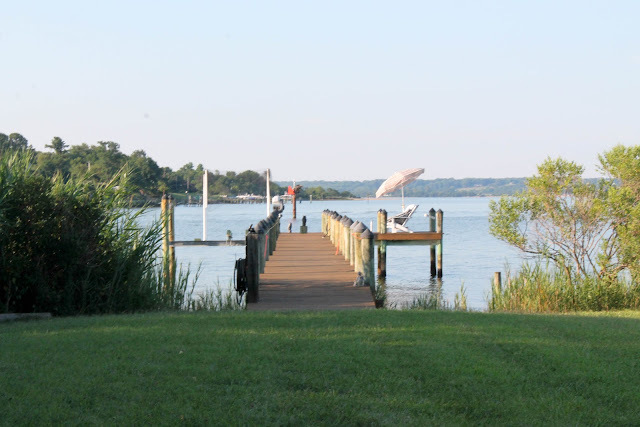 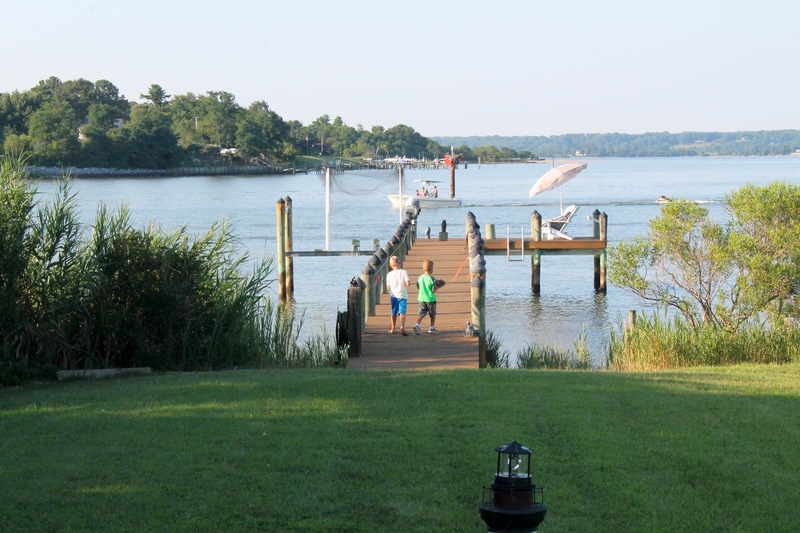 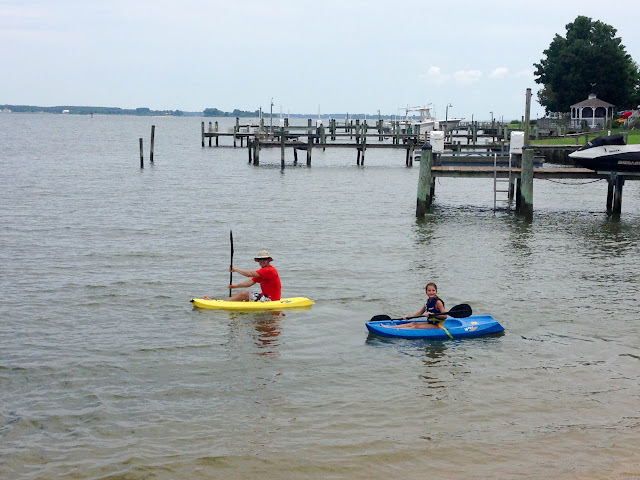 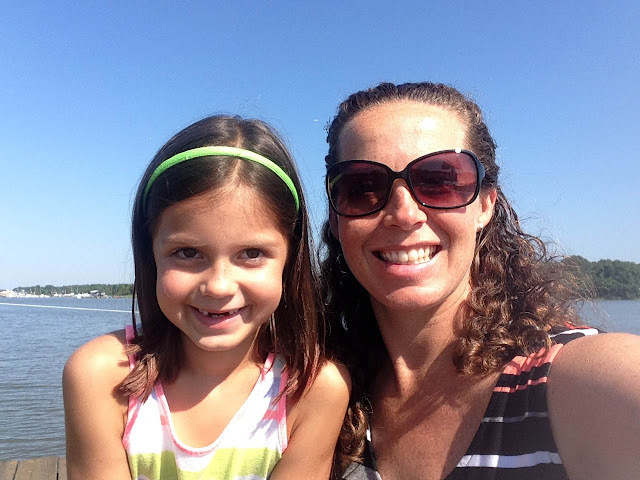 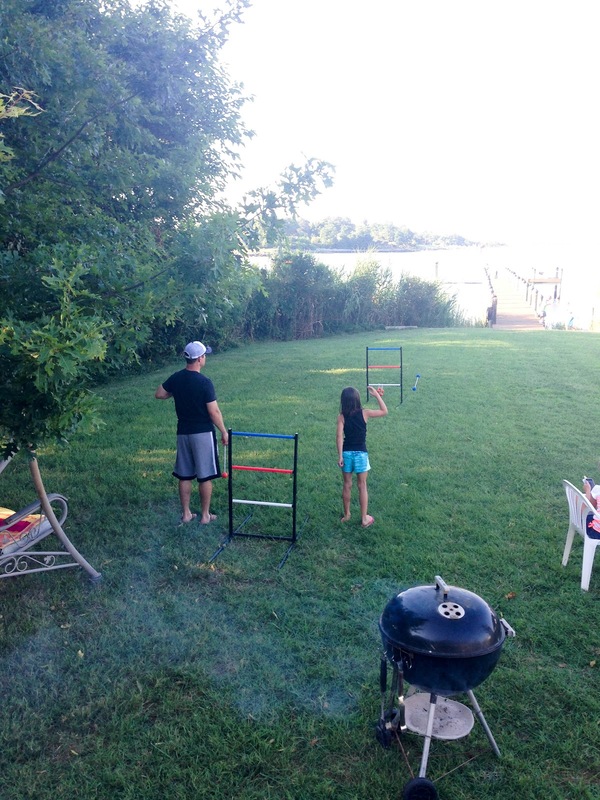 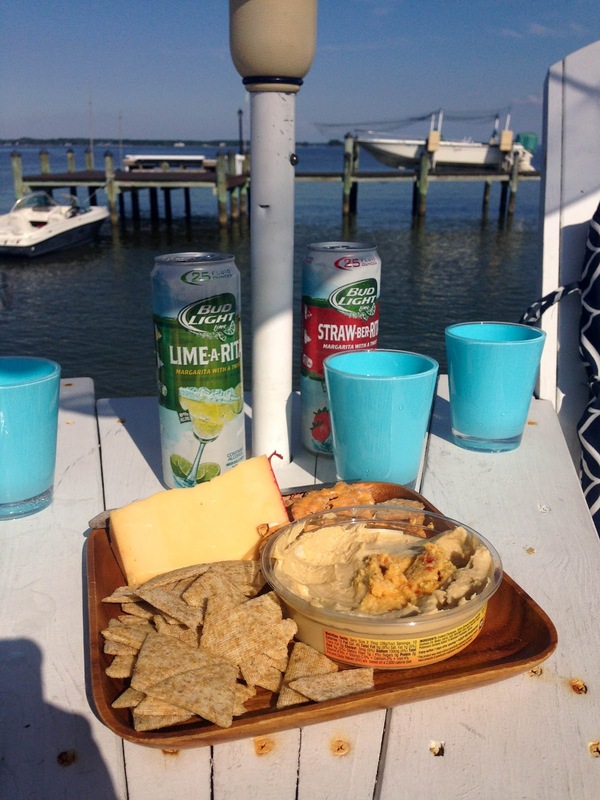 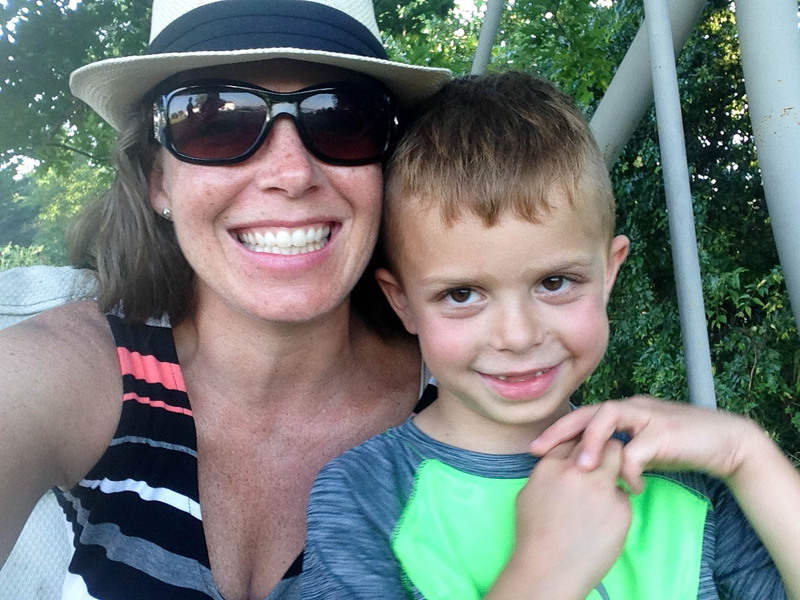 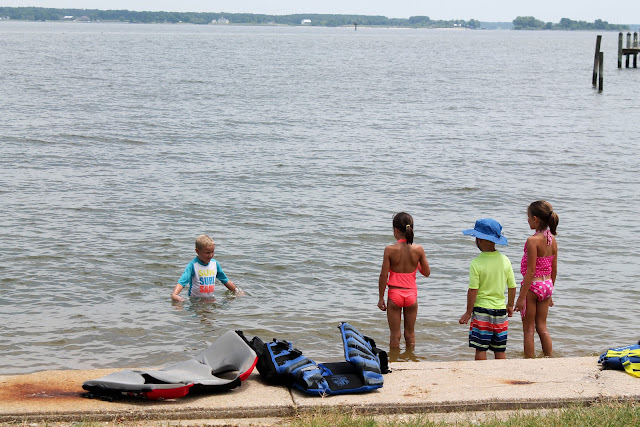 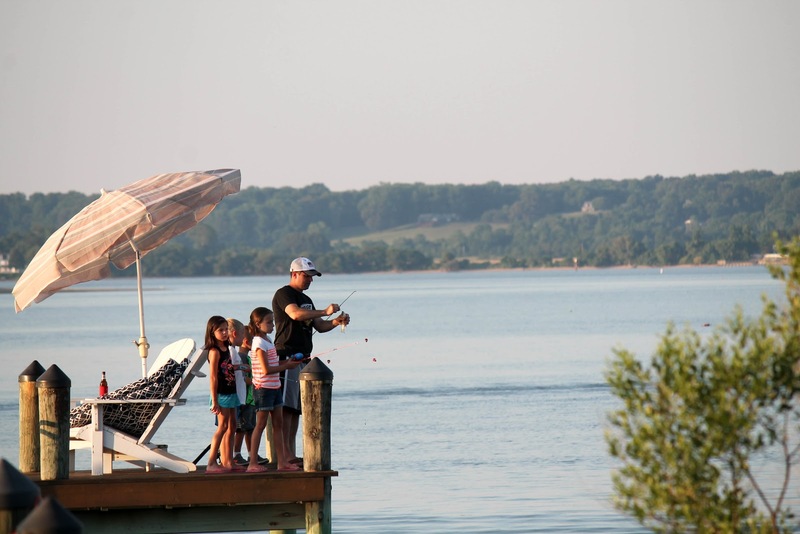 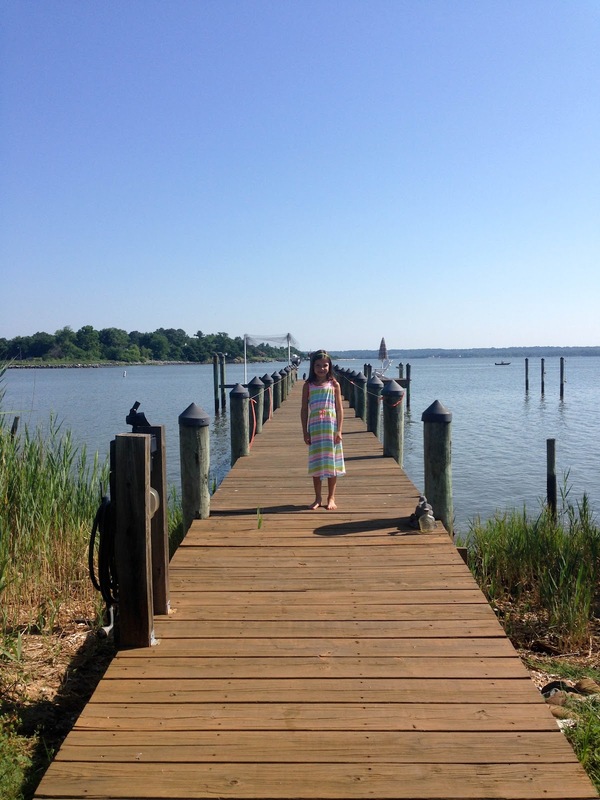 We've had a pretty low-key summer with lots of time at the pool and minimal travel , but last month we did get away for a weekend at Cobb Island, MD. 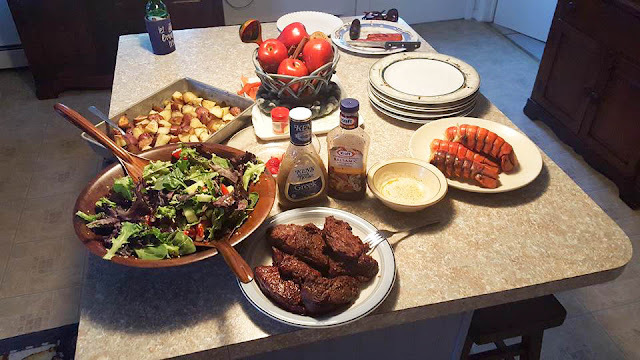 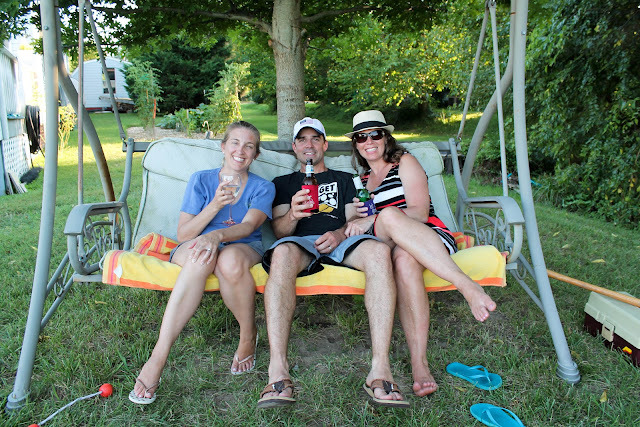 Our awesome friends invited us back to their parent's house this year and we had another relaxing and fun getaway. 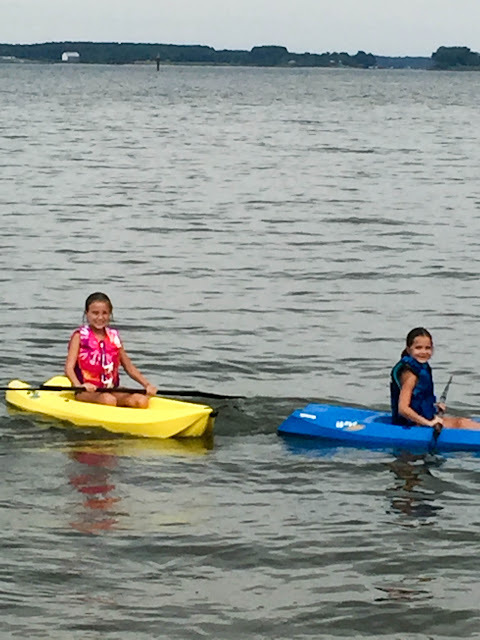 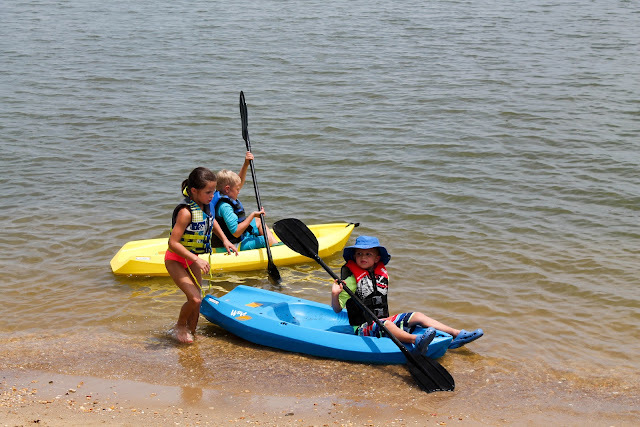 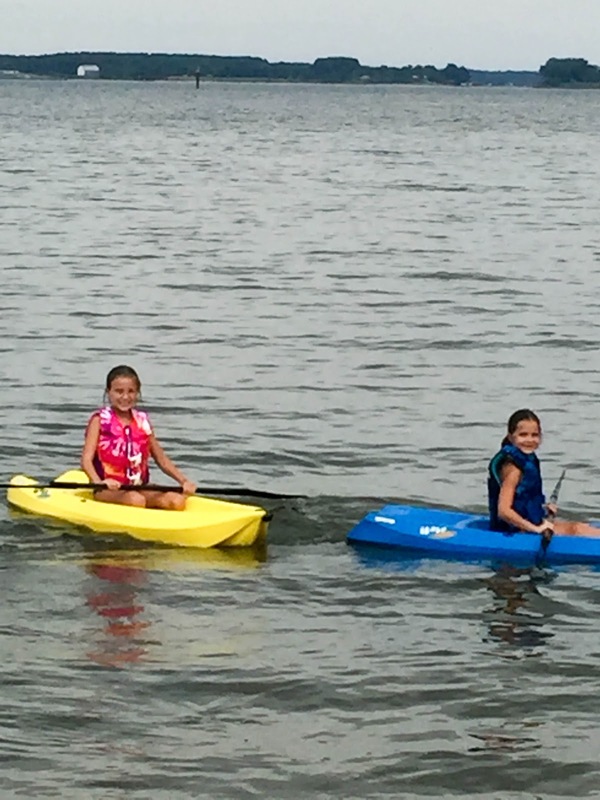 The kids (and Ron) loved using the neighbor's kayaks. 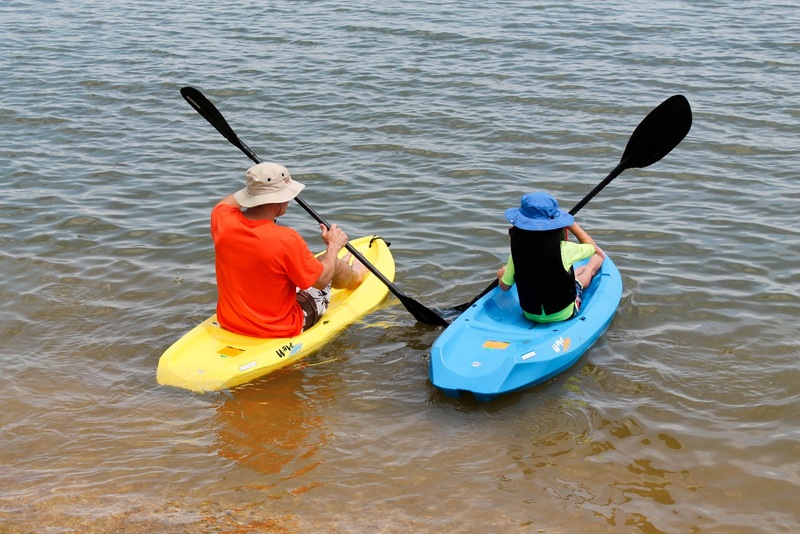 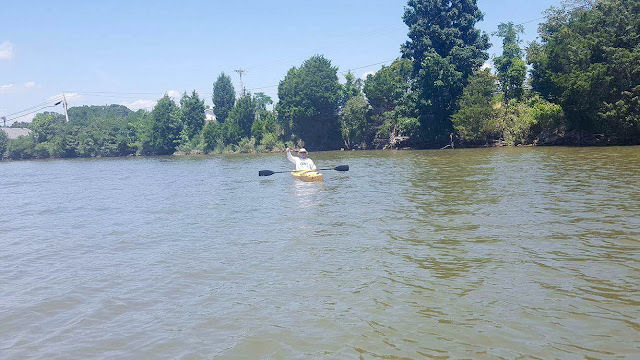 There were a lot of jellyfish around this year, so thankfully the kayaks were available to us or they would have hardly gotten in any water time. 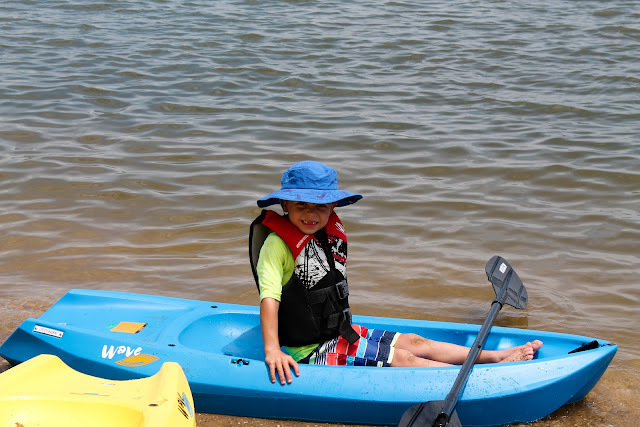 Cooper was brave and venturing out to the "deep" part of the water. 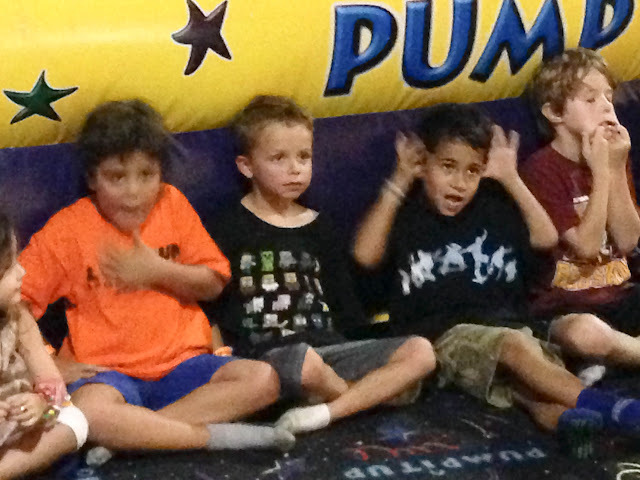 The other kids were amazed. 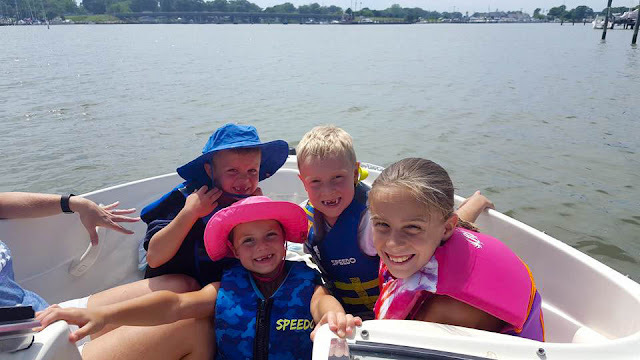 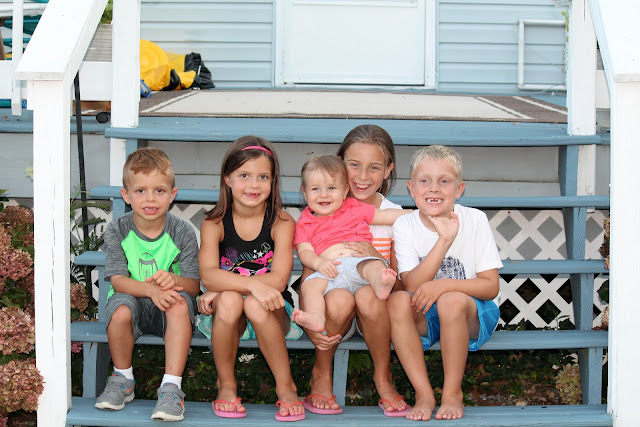 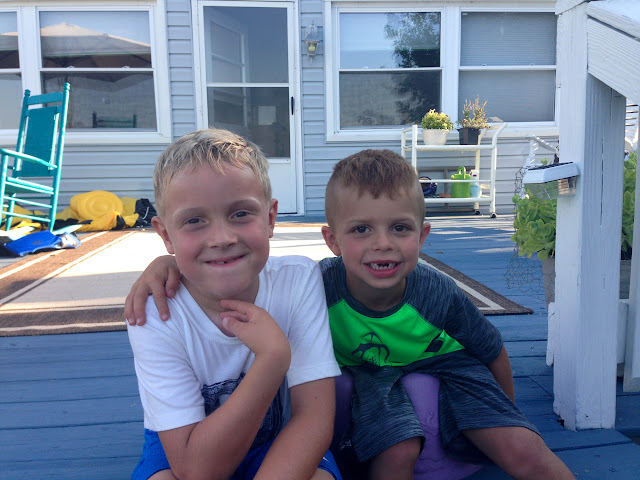 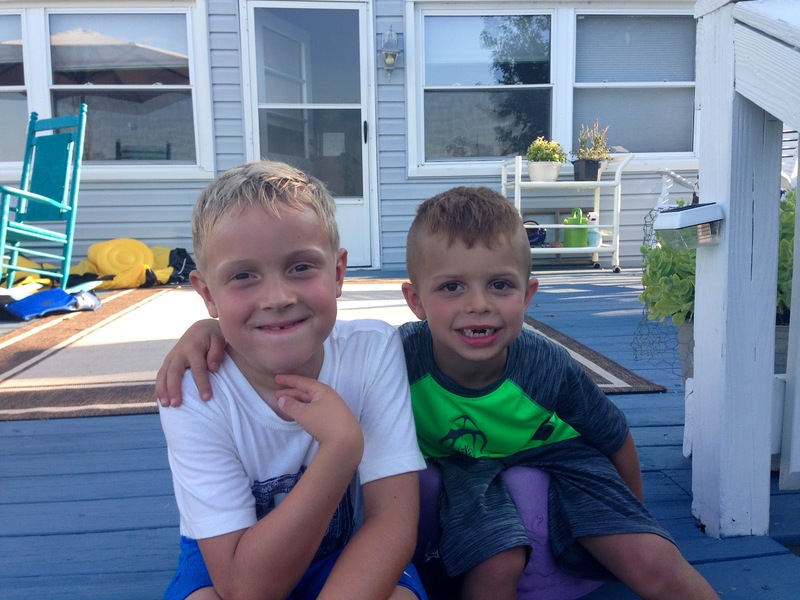 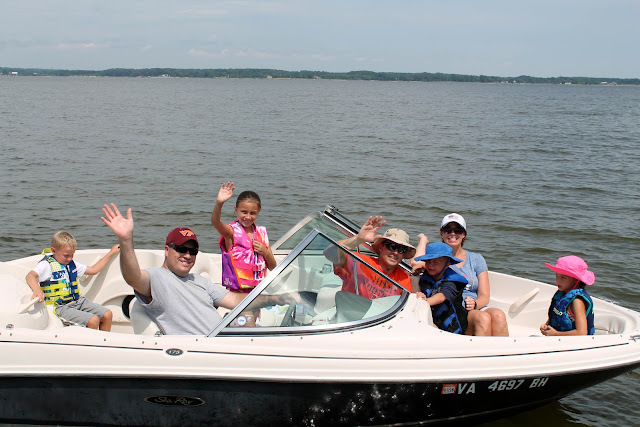 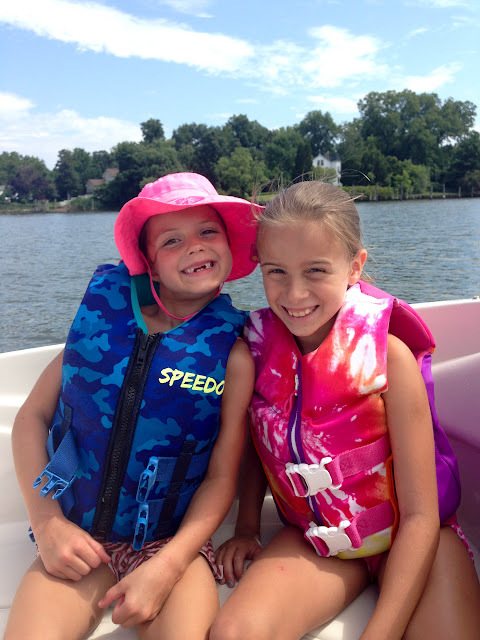 When it was time to take the boat for a ride, it took a lot of convincing to get our kids to agree to go. 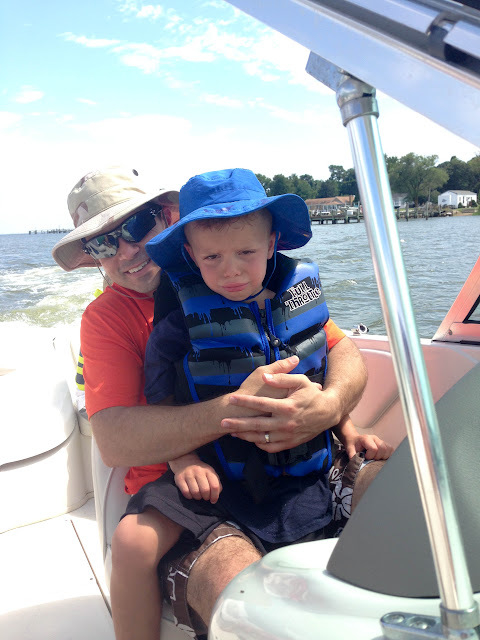 They loved it last year, but as evident in the photos below, Jonathan was not happy about it this year. 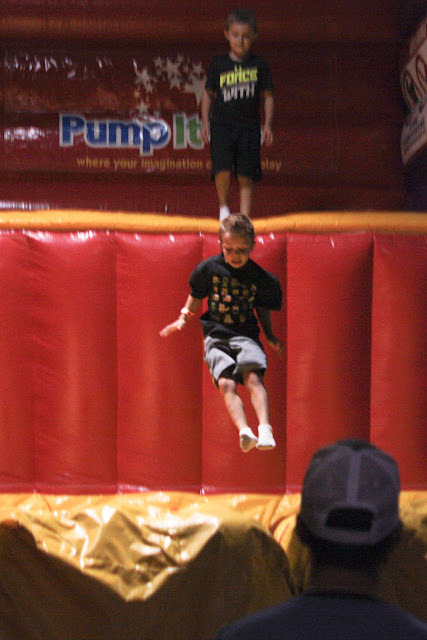 I'm not sure what his fear was, but we pretty much told him he had to try because we knew he'd like it....and we were right! ...but once we picked up speed she didn't like the "bumps" and made us take her back to land. 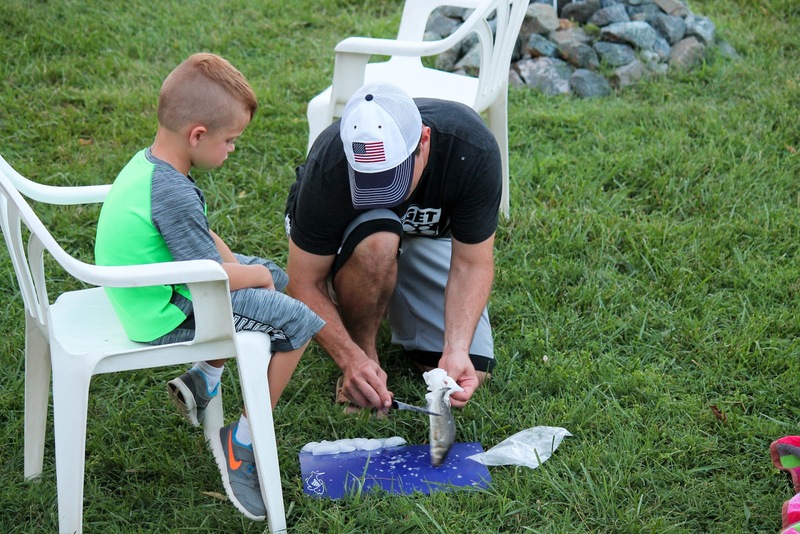 We headed back out and the dads had some fun. 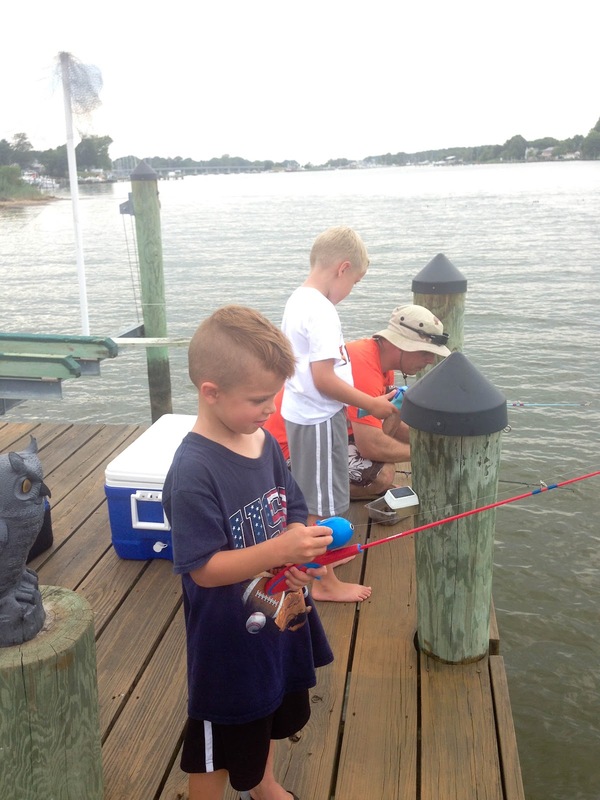 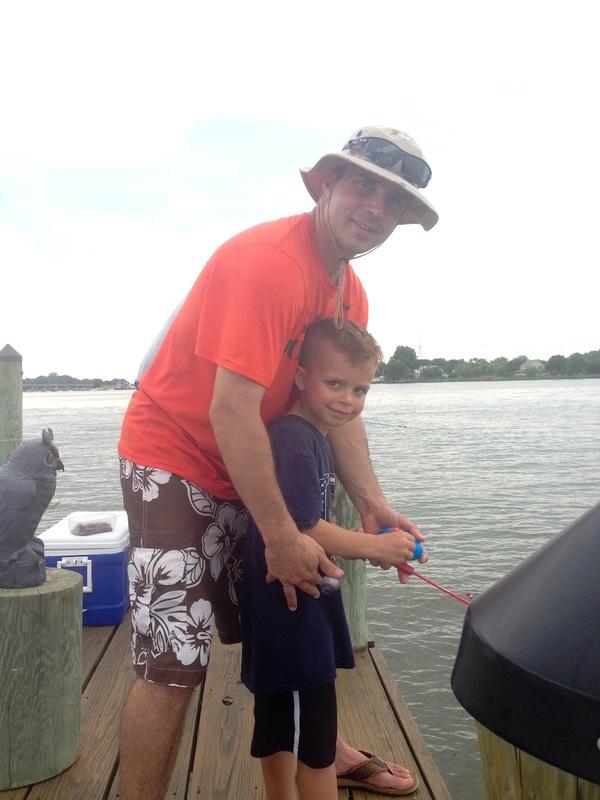 After the boat ride, the dads and the kids did some fishing. 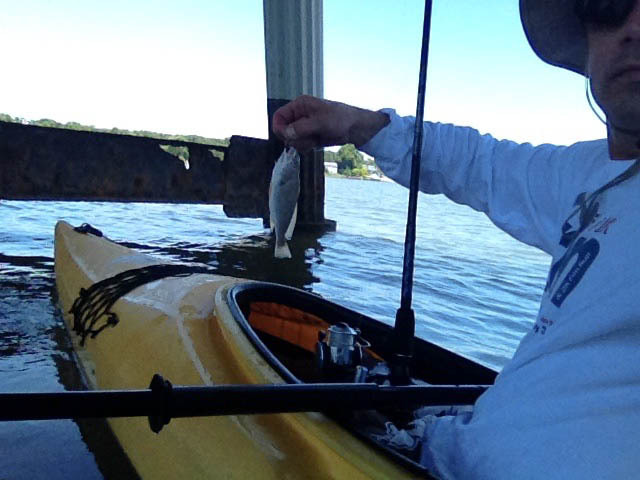 Ron got out for some kayak fishing on Day 2. 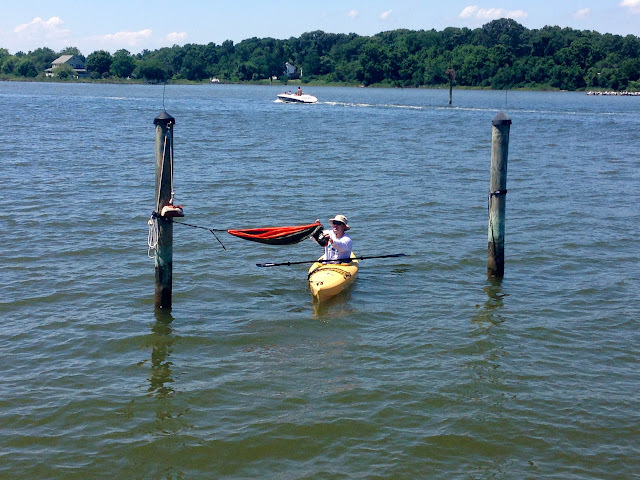 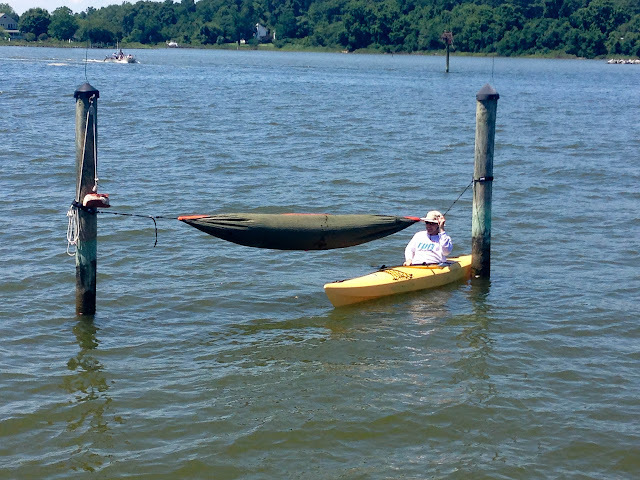 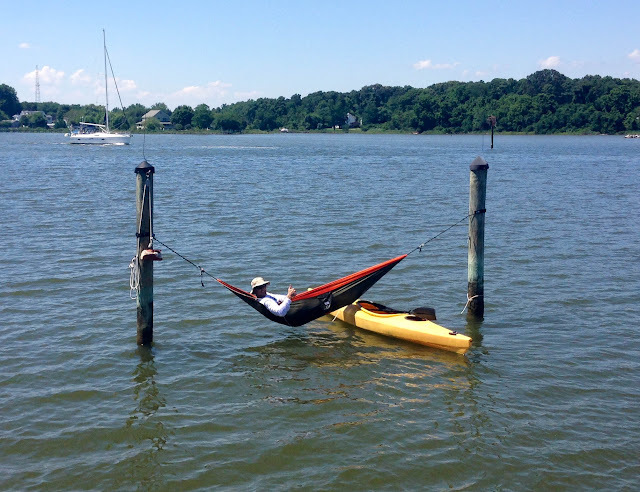 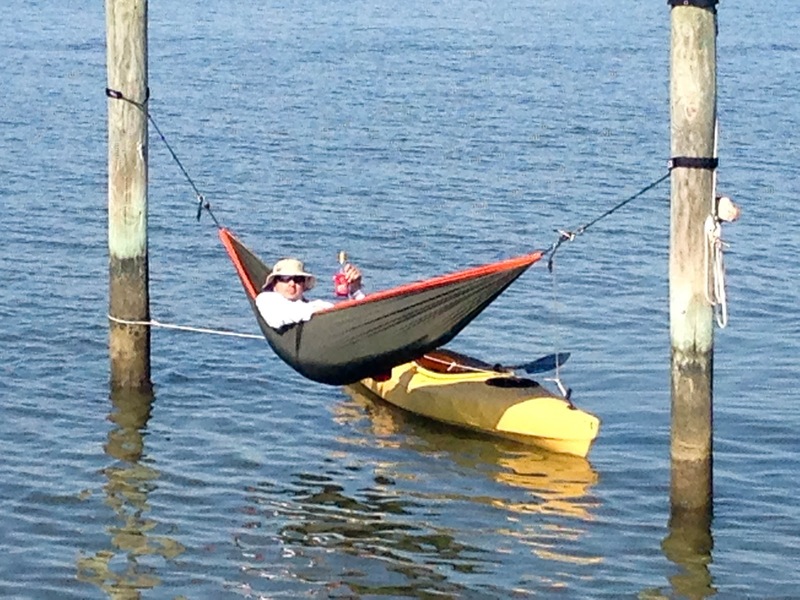 This was pretty much his dream day...being outdoors, kayaking, fishing and chilling in his hammock. He was in Heaven! There weren't any good trees to hang his hammock from so he improvised and found these two posts in the water. 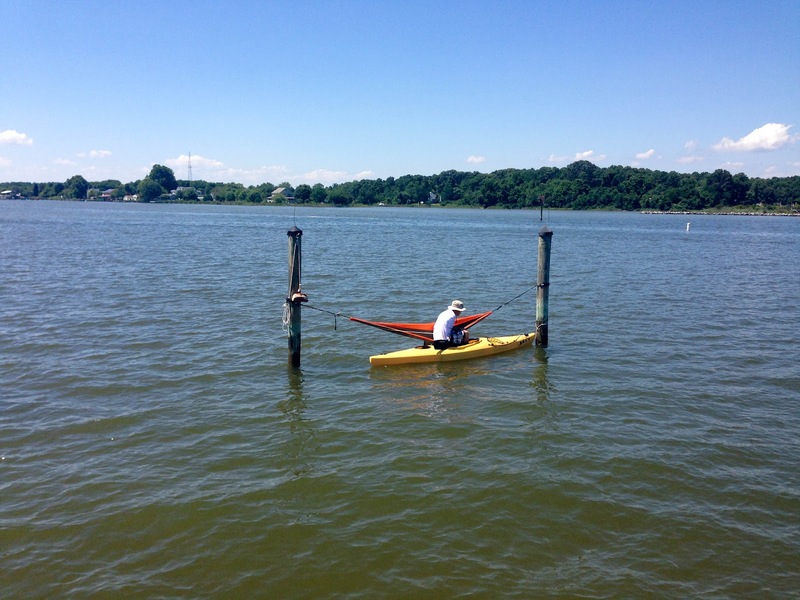 I think Katie and I expected him to fall in while attempting this, but in natural Ron awesomeness, he did it like a pro and made it look easy. He did eventually come back (to get a beer), then enjoyed happy hour in his new favorite spot. 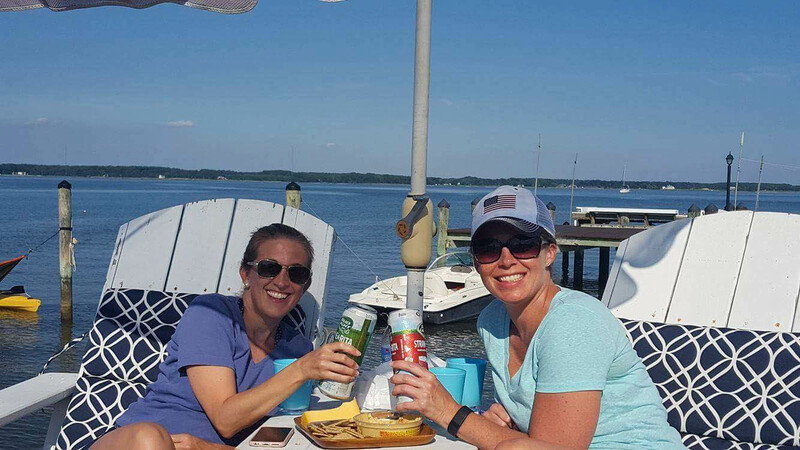 The rest of us enjoyed happy hour on the pier. 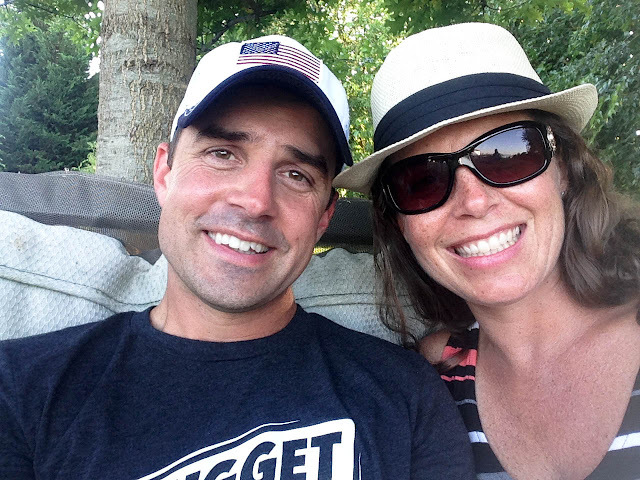 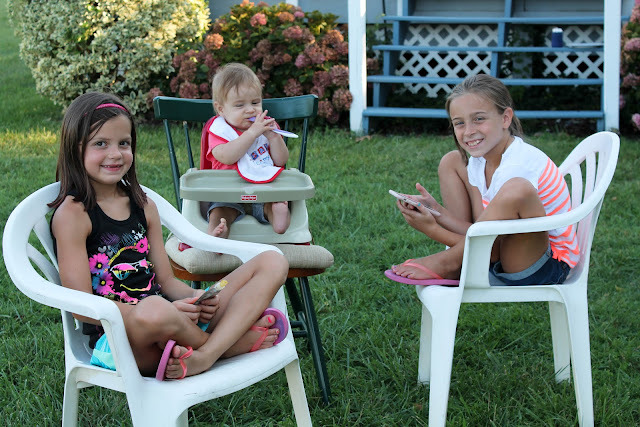 After our waterside happy hour, we hung out in the back yard until dinner was ready. 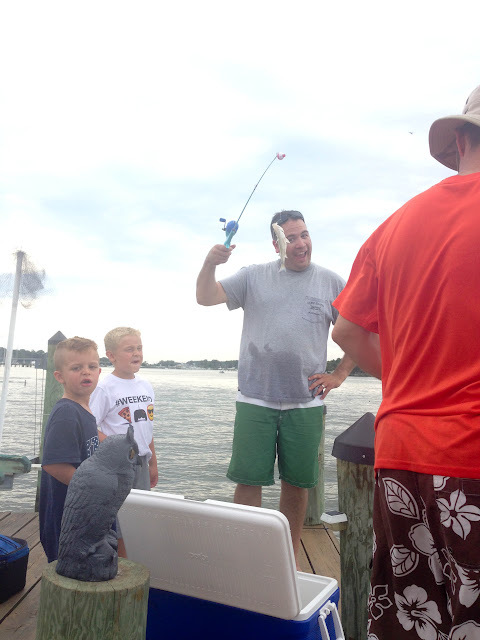 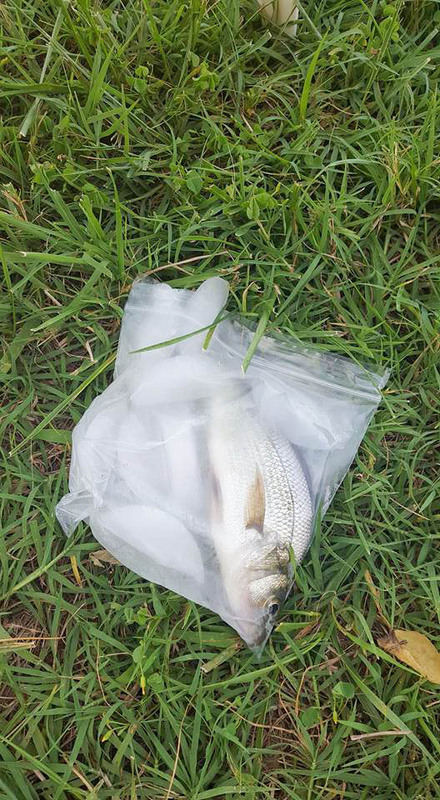 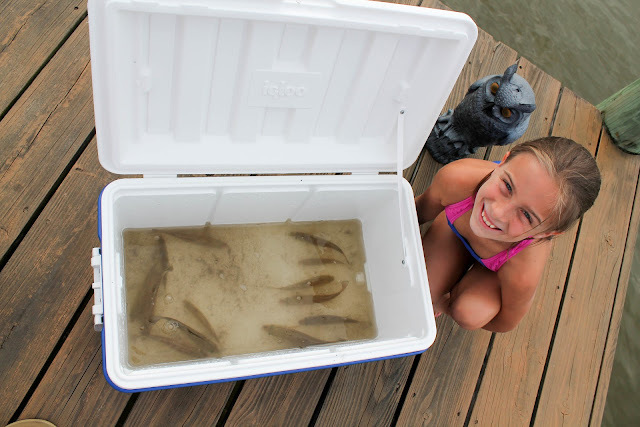 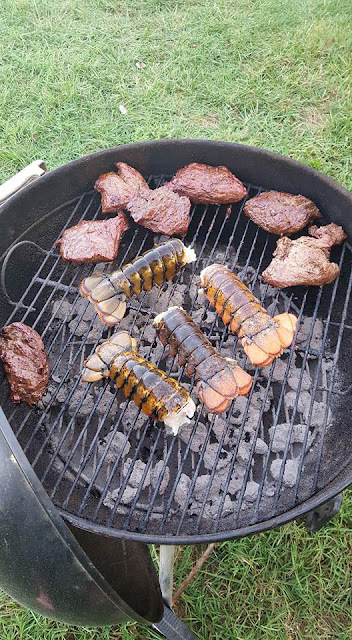 ...and decided to give them the full "eat what you catch" experience. 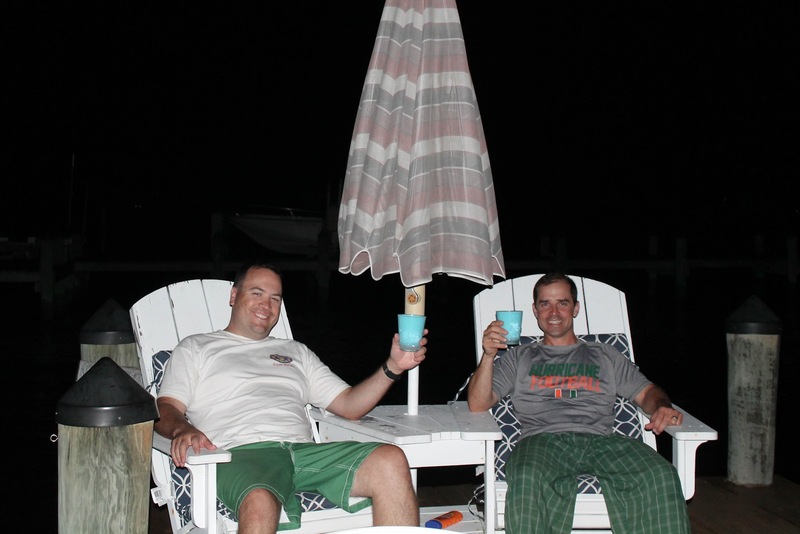 Night cap on the pier while the kids were sleeping. 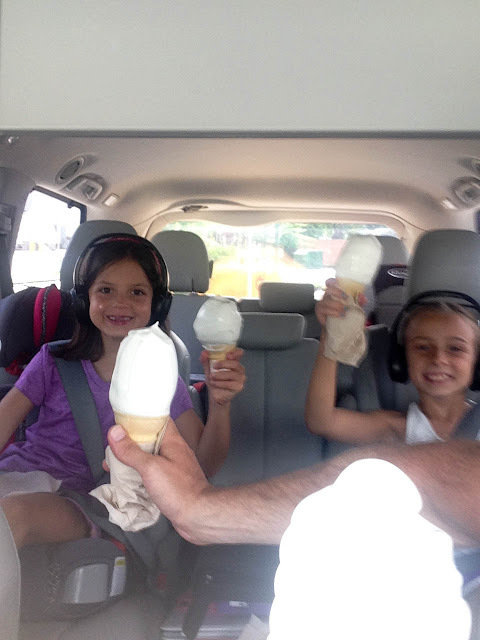 And nothing caps off a weekend at the river better than jumbo ice cream cones for the way home.